IN GEOMETRICAL TERMS, a square also qualifies as a rectangle—a four-sided plane figure with four right angles—but a rectangle does not always meet the criteria to be a square—a figure having four equal sides. Such is the case with land bridges and isthmuses. An isthmus qualifies as a land bridge—a strip of land linking two landmasses, allowing free migration in both directions—but a land bridge is not always an isthmus, which is a narrow land bridge; the Isthmus of Panama, measuring 30 mi (48 km) at its narrowest point, for example, is an isthmian land bridge, whereas the Bering land bridge is believed to have been approximately 1,000 mi (1,609 km) wide during the Pleistocene Ice Age and would not have been considered an isthmus. Land bridges are temporary in nature, and can disappear and reappear when geologic changes occur to the land or when the sea levels rise and submerge them or lower to expose these bridges of land. In addition to the above-mentioned Bering land bridge between Siberian Asia and ALASKA, the SINAI PENINSULA (23,500 square mi or 61,000 square km) is a triangular land bridge, linking northeast Africa with southwest Asia, and is home to over 200,000 people (1986). The Torres Strait waters (90 mi or 145 km wide) between PAPUA NEW GUINEA and AUSTRALIA have contained various land bridges when the sea levels were lower, exposing the continental shelf. The migration of people and species across land bridges during glacial periods is what interests many scientists. Numerous species of flora, fauna, and animals have extended their ranges to new lands because of the isthmuses and land bridges that have intermittently connected different lands. 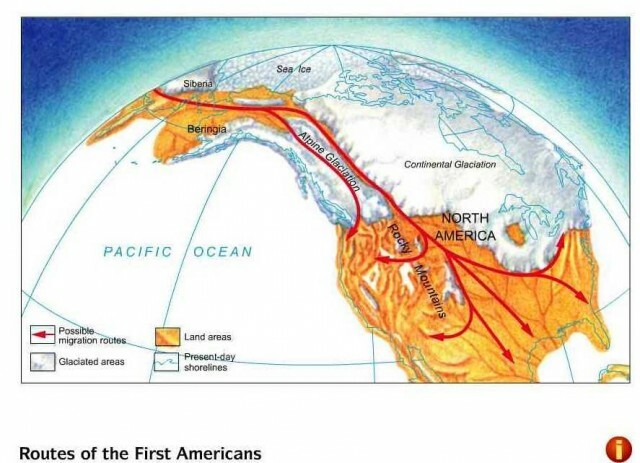 Today, it is believed that the first humans in North America entered by way of the Bering land bridge, also referred to as Beringia, and although many Native Americans dispute these claims based on spiritual beliefs, archaeologist finds in both SIBERIA and the Bering land bridge region indicate similar tools, dwellings, and practices distinct to the Siberian region, suggesting there was a human migration between the two regions. Beringia was wide grassland and it is highly likely that people made it a home—however brief because of the cold climate. The population of the Sinai Peninsula is primarily along the coast, and the main industries include fishing, mining, and tourism. Harsh weather makes this land bridge a natural barrier between the competing interests in the surrounding countries. The ongoing disagreements have led to several conflicts, primarily over the Suez Canal along the western perimeter of the peninsula. Active land bridges serve as important trade routes, and the Sinai Peninsula controls much of the trade between Asia and Africa, illustrating the role past land bridges have played. possible to see Pleistocene volcanoes in the area, and approximately 17 islands in the Torres Strait are currently inhabited. The islands act almost like steppingstones between Australia and Papua New Guinea, with a “trail” of flora, fauna, people, and customs traceable from landmass to landmass. Geological similarities between Africa, South America, Australia, INDIA, and ANTARCTICA indicate that 150 to 300 million years ago, a supercontinent, referred to as Gondwana or Gondwanaland, made up of these countries could have existed. Recent studies suggest that land bridges might have connected the regions, rather than one large land mass, and new developments in the fields of geology and geography will likely help to answer these questions in the future.